“Mummies of the World,” the largest exhibit of mummies ever assembled, premieres today at the California Science Center in Los Angeles. A hundred and fifty rarely-seen human and animal mummies and associated artifacts from Peru, Chile, Germany, Hungary, Italy, Netherlands, Switzerland and Egypt, and ranging in date from 6,000 B.C. to the 18th century, will tour the United States for the next 3 years. It’s not just an extraordinarily large and eclectic collection of mummies, but a hands-on, interactive display of the scientific tools used to study mummies today in a non-invasive, respectful manner. Each mummy, the scientists say, has a story. And with the advent of new technology, such as CT scans and DNA analysis, these histories can be revealed without harm. CT scans in particular are considered the gold standard in mummy research, providing remarkable three-dimensional records that allow researchers to see details such as heart defects, tumors and evidence of respiratory infections like tuberculosis. “We can essentially do a virtual unwrapping of the mummy,” said Gill-Frerking, also scientific research curator of the German Mummy Project. Unlike Victorian “unwrapping parties,” this procedure provides valuable information about the mummies’ insides without damaging them. Other scientific tools covered are DNA analysis, X-Rays and radiocarbon dating. There are touch screen kiosks explaining all these methods of studying mummies, a high-powered microscope you can look through to examine a mummy’s tooth, and samples of what mummies feel like. They don’t use actual mummy skin, though; it’s a reproduction. Their very careful to ensure the mummies are treated with consideration and respect. In fact, the descendants of one of the mummies (Baron von Holz, an 17th century nobleman found in the castle crypt who is thought to have died in the Thirty’s Year War) were actively involved in the study and display of their ancestor. The exhibit also explores the different ways corpses become mummified. The classic movie-style Egyptian wrapped mummy is represented, of course, but so are natural mummies created in well-ventilated, dry environments or in counter-intuitively mushy ones like peat bogs. 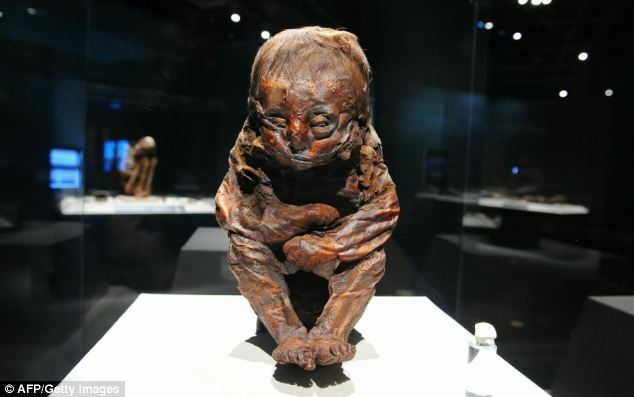 Mummies of the World will be at the California Science Center from today through November 28th. After that, it tours for 3 more years, but I can’t find a schedule. I’ll keep looking.